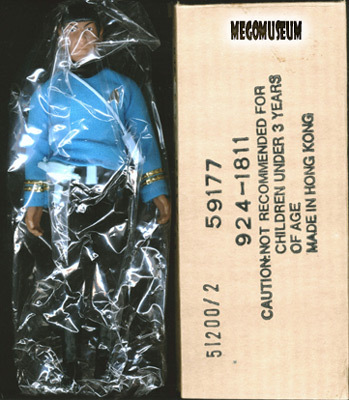 Mr. Spock (Item No. 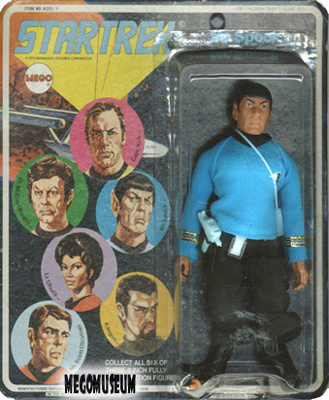 51200/2), science officer and second-in-command of the Starship Enterprise, as portrayed by Leonard Nimoy. The head sculpt on this figure is probably not as accurate as Mego could have been, with regard to the actor's likeness, but it is still a charming visage nonetheless. The head probably bears a closer resemblance to its animated counterpart rather than its real-life model. All this aside, though, the face sculpt does an admirable job of reflecting the inquisitive and emotionless qualities of the Vulcan, while still betraying the slightest bemusement at the foibles and failings of humans. 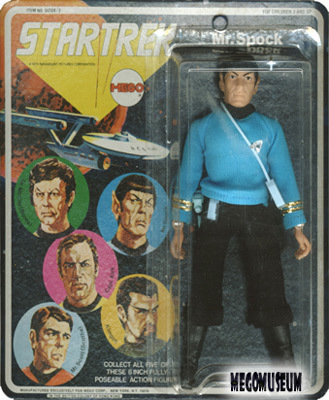 The Mr. Spock figure went through three distinct face incarnations. The first was a Type 1 head (lighter flesh) with light-pink detailing on the lips (left). The next was a Type 1 head (lighter flesh) without lip paint (center). The third and final head was a Type 2 head (darker flesh) without lip detailing. The first is certainly the rarest, while the third is, by a sizeable margin, the most common. 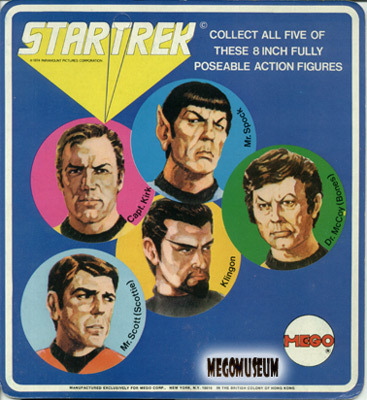 Mego Spock on a "5-face" card. 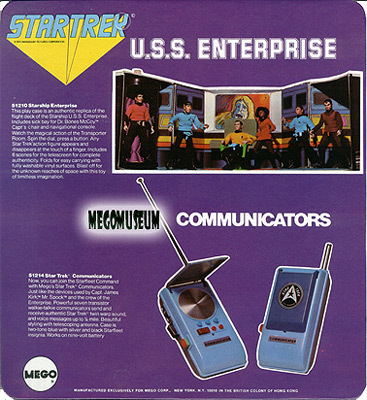 During this time Palitoy (UK) also produced the trek figures on these cards, the only unique difference is the addition of the word "Palitoy" in the trademark area. 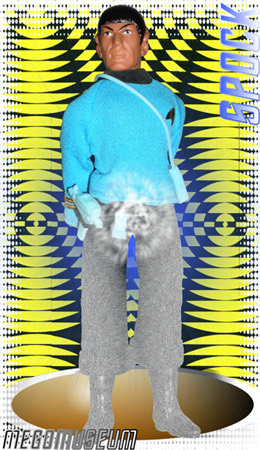 Here we have a Mr Spock on a "6-face" card with the name in white lettering. 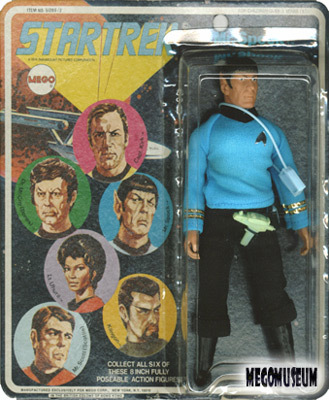 The infamous "Blank-Back" 1978 Spock Sears re-release (Item No. 91221/1). 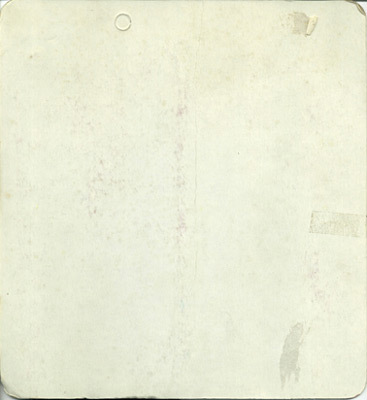 Note the broken legs; "Blank-Backs," being later releases, were notorious for the inferior plastic used in their manufacture. 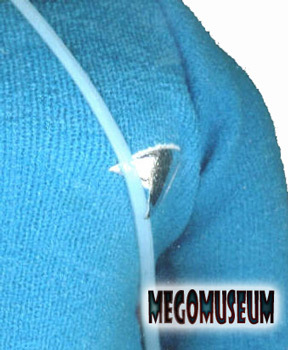 Of special note is the "white-edged" foil insignia on the blank figures, presumably heat-sealed (an insignia method Mego began implementing in the late 'Seventies). 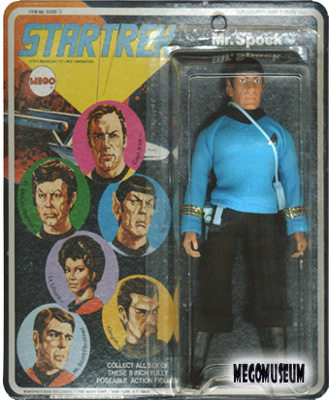 Mego Mr. Spockand his Sears catalog mailer box.